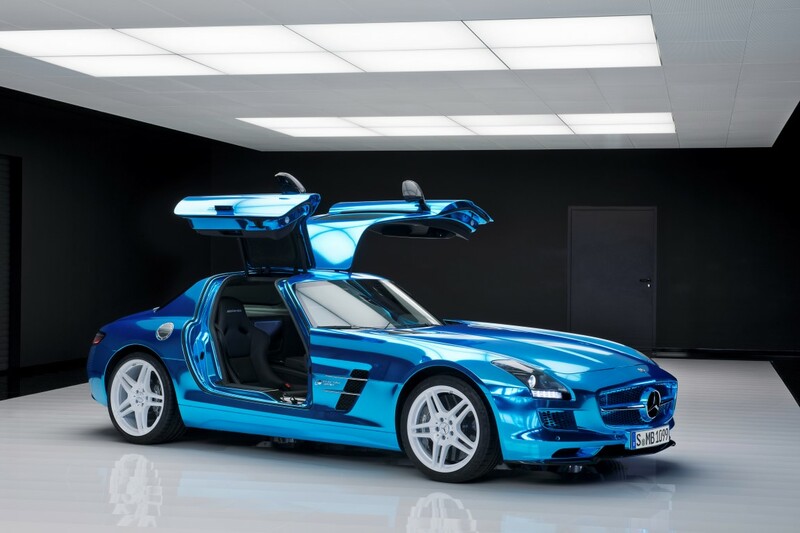 Gullwing doors, shockingly shiny blue finish, white wheels, a sports car-stomping 740 horsepower, and… no exhaust pipe? 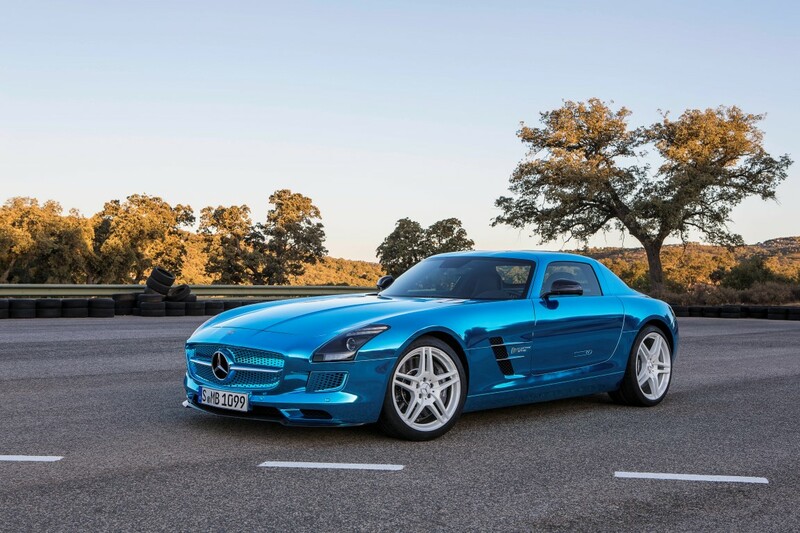 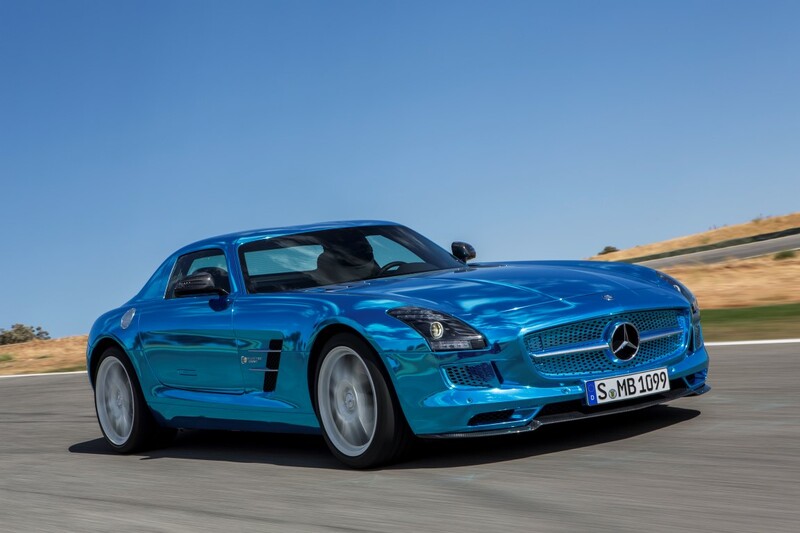 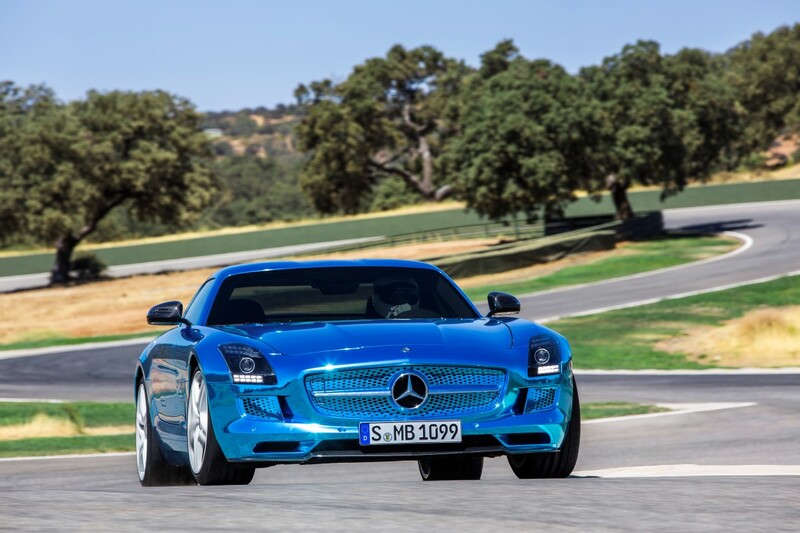 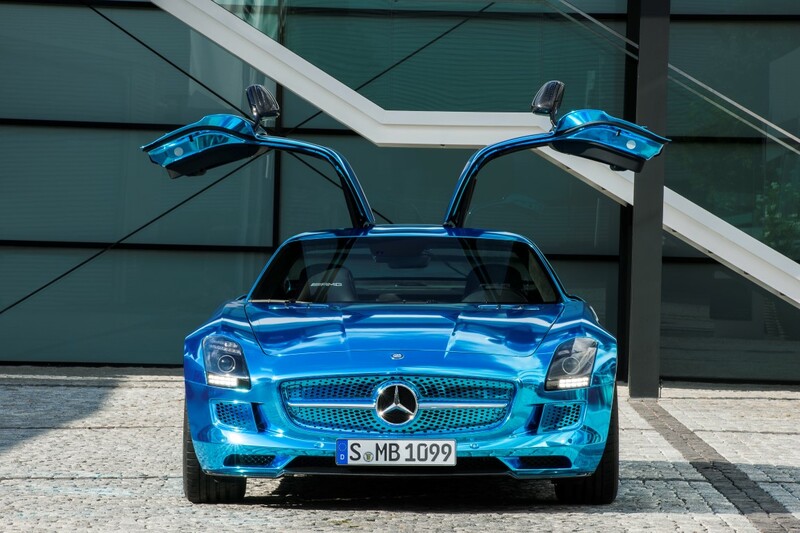 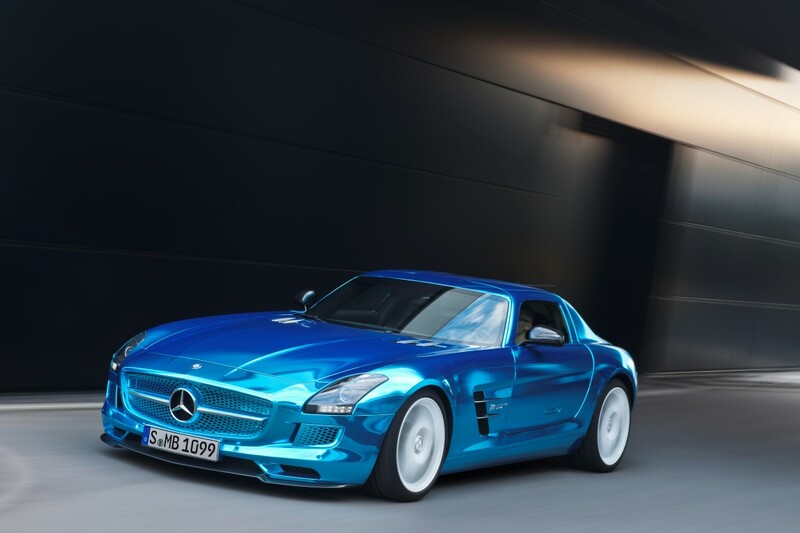 That’s what was on tap at AMG as Mercedes-Benz’s performance division unveiled its 2014 SLS AMG Electric Drive supercar at the Paris Motor Show. 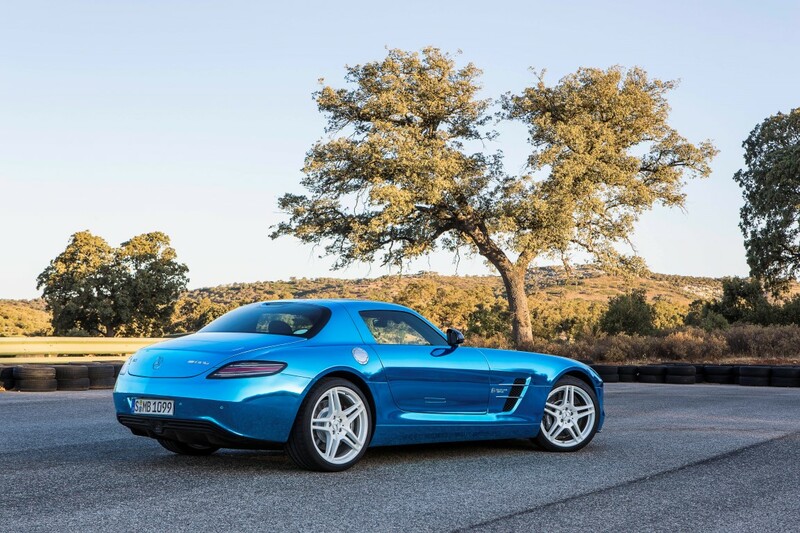 The electrified SLS is a production version of Mercedes’ earlier SLS AMG E-Cell concept and is the most powerful series-production electric vehicle ever. 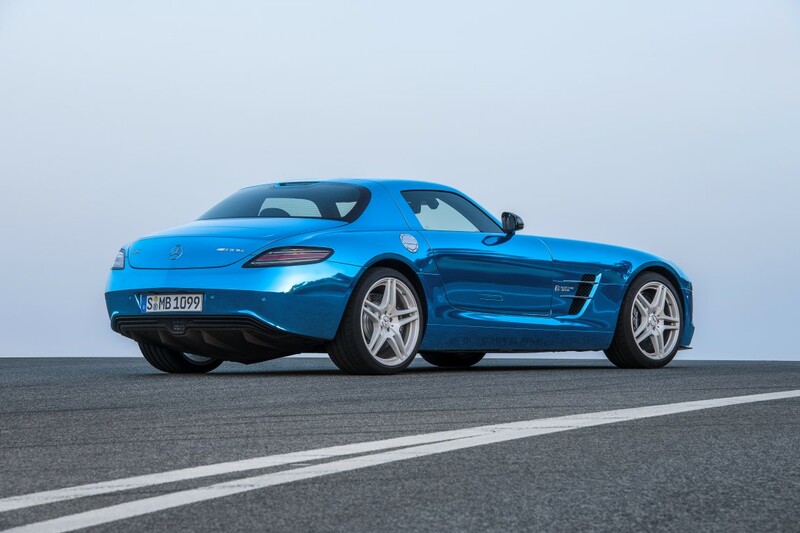 It’s also the most expensive Mercedes road car to date (minus the Maybach line and race-homologation street cars like the CLK-GTR). 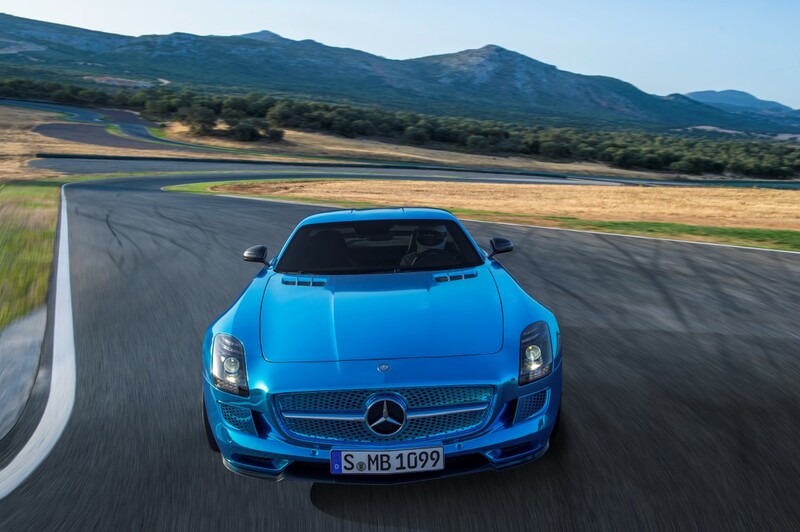 Four drive motors (one per corner) provide permanent four-wheel-drive and deliver 552 kW — or 740 hp — and a potent 738 lb-ft of torque. That gives the Electric Drive a 177 hp and 259 lb-ft advantage over the 6.2L V8 in the normal SLS AMG. 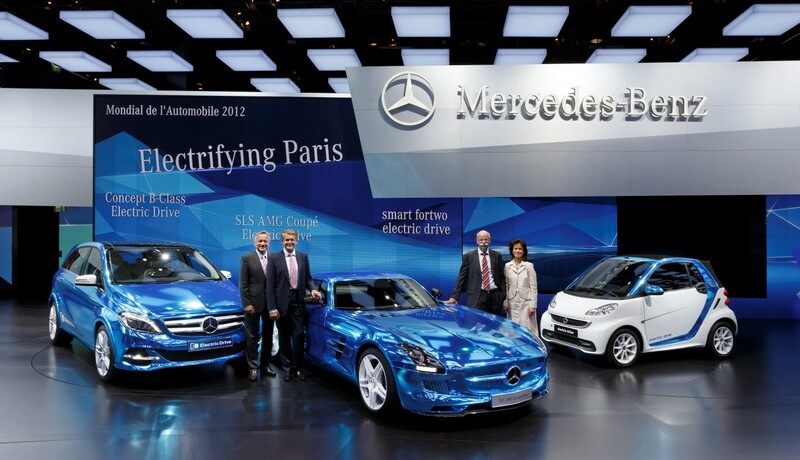 The EV goes 0-60 mph in 3.9 sec and is electronically limited to 155 mph. 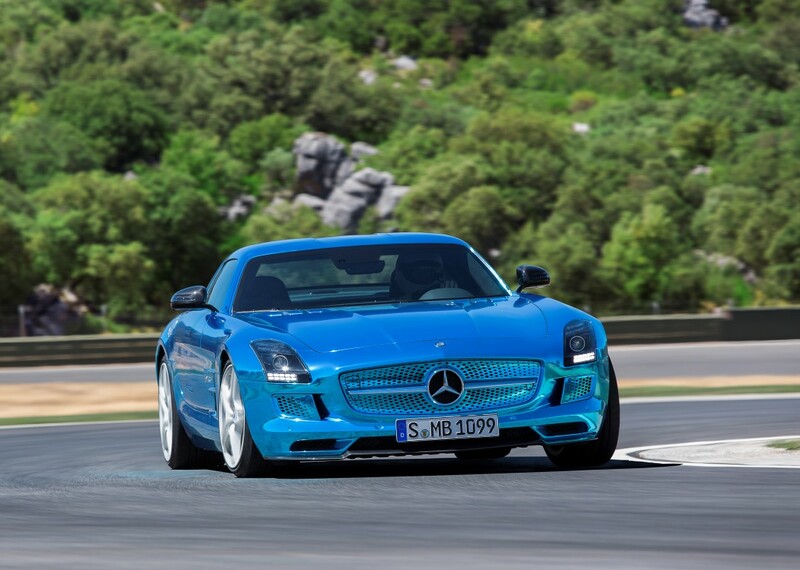 60 kWh of batteries yield 155 miles of driving range. 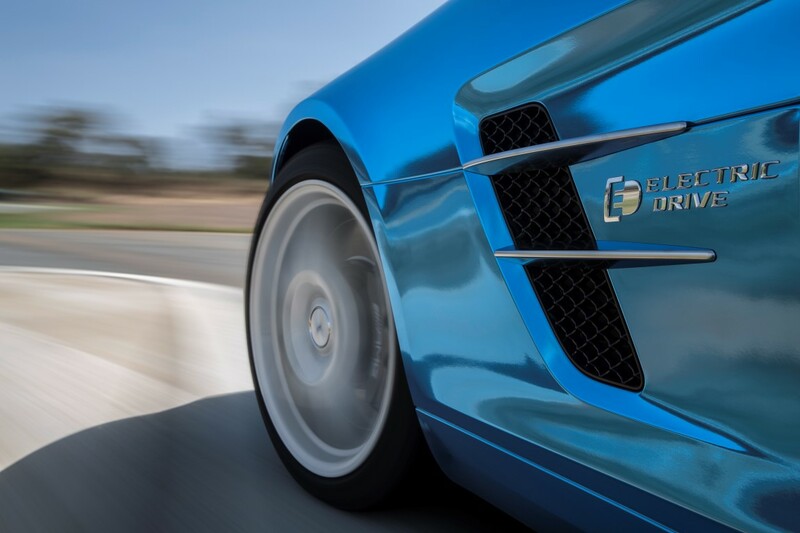 Despite the added weight of the 1,200 lb battery pack, the Electric Drive is just 0.2 sec slower to 60 mph than the gasoline car, and the four-wheel-drive and low center of gravity should improve traction and some aspects of handling. 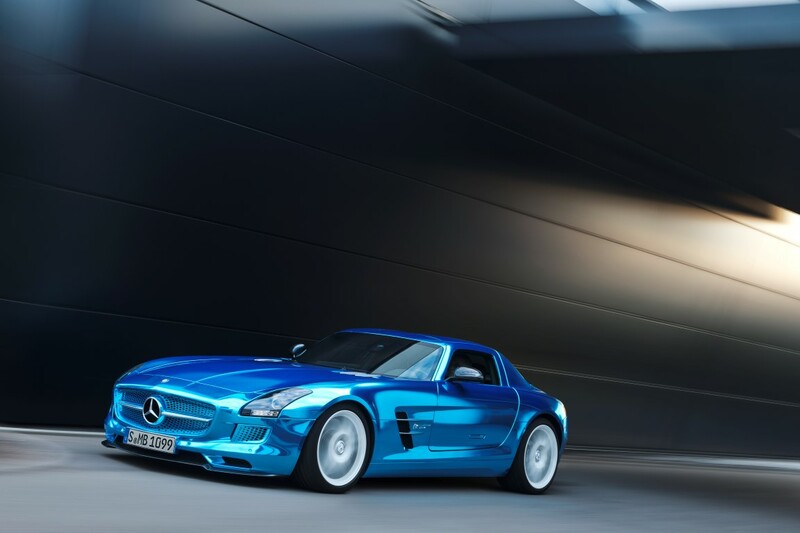 To counteract the battery weight, AMG replaced much of the standard car’s aluminum structure with carbon fiber and gave the car a redesigned suspension, carbon-fiber ceramic brakes, and a battery pack that fills the former transmission tunnel and fuel tank areas. 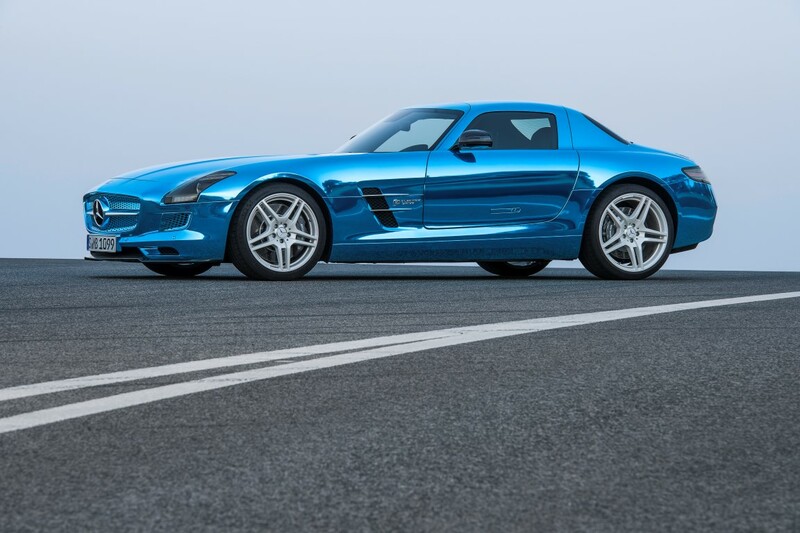 Body mods are limited to a grille insert, badging, new bumper trim (where the exhaust pipes would be), and a crazy chromed blue color (at least on the demo car). 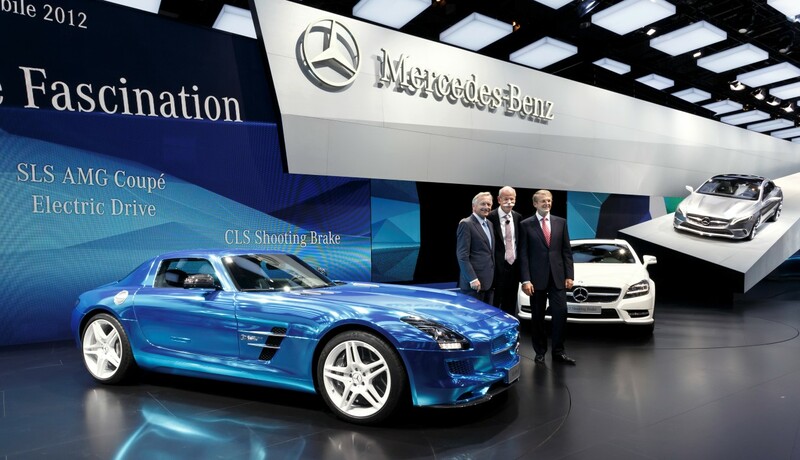 Deliveries begin in June 2013. 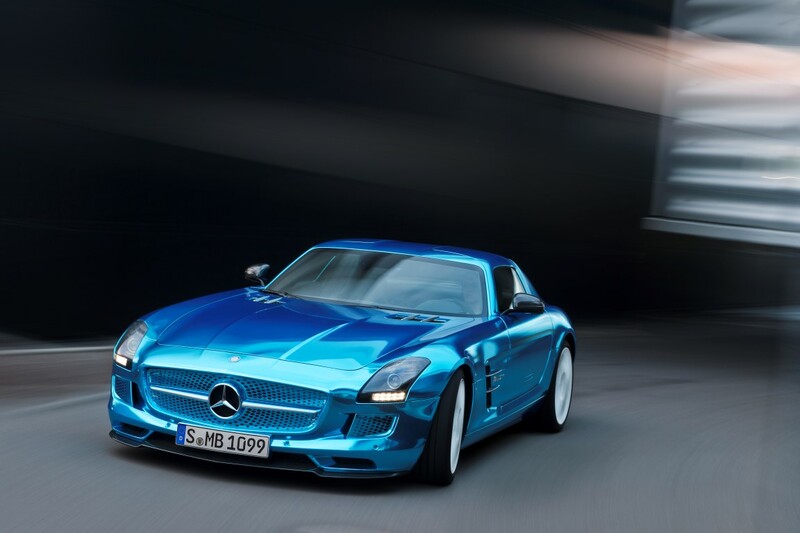 If you’re in Germany, all you need to do is fork over €416,500 (the equivalent of $540,000, including a 19% sales tax). 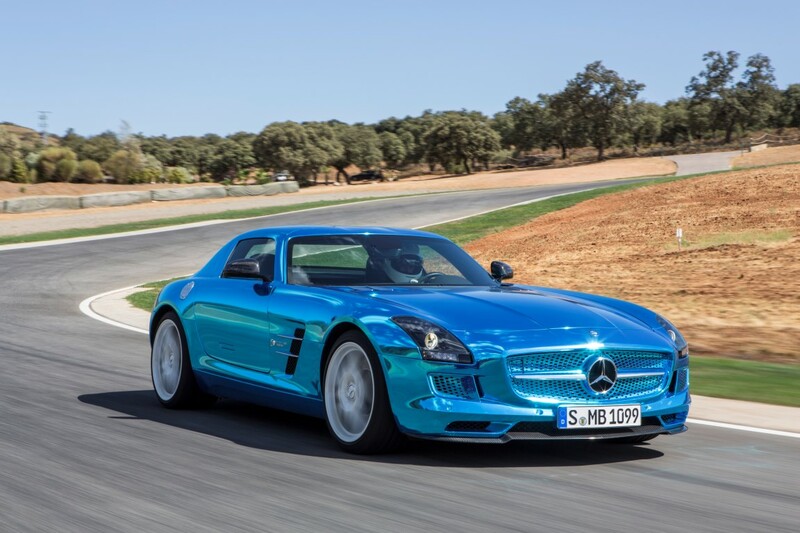 For reference, that’s more than double what the standard SLS AMG costs (€177,310 to start). 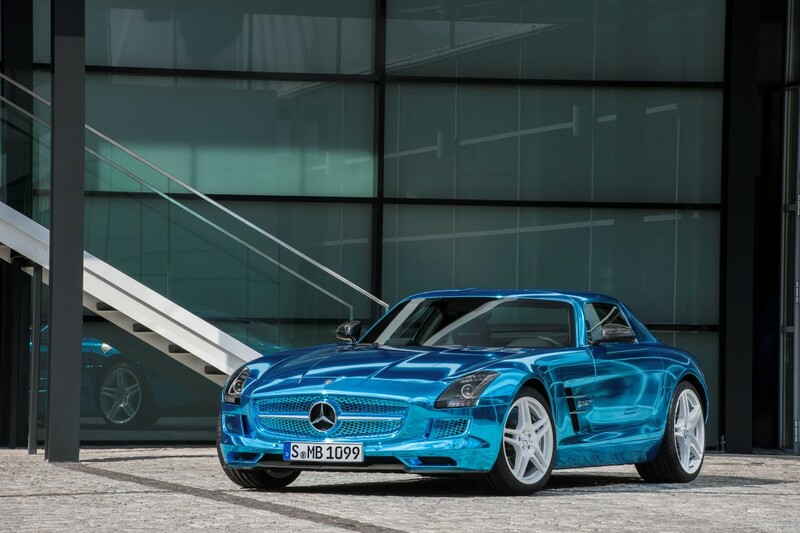 That’s probably more due to the carbon fiber structure than all the EV components, though.